Sometimes you find a recipe that is a perfect fusion of winter and summer. When I think of a crumble, I think of eating it by a warm fire on a cold winters' day. But when I think of red fruits, summer and my little fruit garden springs into mind. Less idealistically, the red fruits I used for this jumbleberry crumble are not the fruits from my garden. I bought them frozen and ready from the grocery store. Usually a recipe requires you to thaw your fruits, but with Nigella Lawson's jumbleberry crumble, everything is frozen - even the crumble topping! 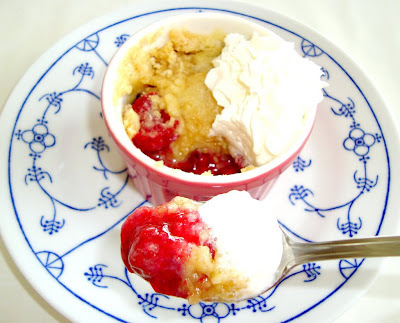 So you can whip up this crumble whenver you feel like and be done in a few minutes. Lovely! Rating: 4+ out of 5. - Put the flour and baking powder into a bowl and rub in the cubes of butter with your fingers until you have a mixture like coarse sand. This is such a small amount, it’s not really worth getting out the heavy machinery. - Stir in the sugar and then put into a freezer bag to freeze. - Preheat the oven to 425°F. 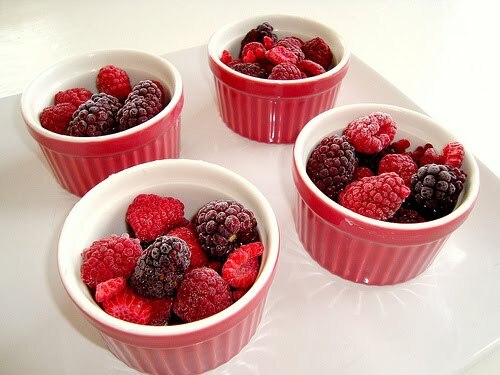 Put the summer fruits in either a cup or a ramekin and sprinkle over the cornstarch and sugar. Stir around a little. - Sprinkle over the frozen crumble topping and bake the cup for 20 minutes and the ramekin for 15 minutes. It is almost as if I matched the ramekins with the red summer fruits, but this is just a (pretty) coincidence, I assure you. 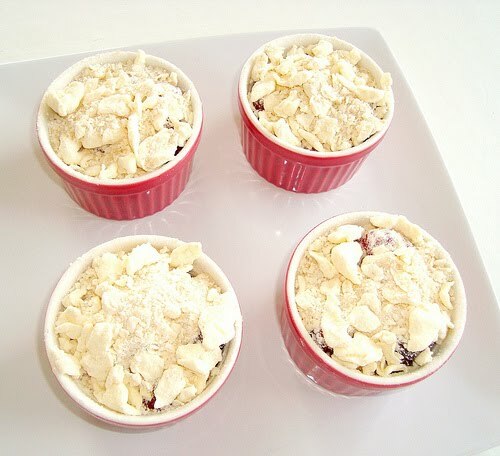 Frozen fruits with a frozen crumble topping. "Jumbleberry" refers to the mixture of leftover fruits. It was so delicious! 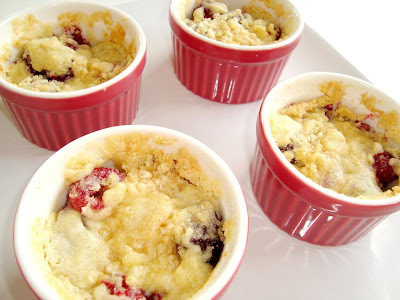 Luscious, warm berries with a sweet crumb topping! Oh, and some whipped cream ;) Exactly what I was craving for. I loooove how easy and delicious this looks! Definitely a must-try when I want something other than cake! Thankfully, this time I knew better than to log on here hungry...that looks amazing! I know i love this recipe, it so quick and really yummy! These look so lovely and yummy at the same time. And I am a big fan of Nigella.